Bobby Petrino led Louisville to a 49-9 overall record from 2003-06. Charlie Strong leaving Louisville for Texas has many Cardinals fans wondering who will replace him as their head football coach and keep the program a national power. Rather than a phone call or sending an email, one die-hard Cardinal left a note for athletic director Tom Jurich outside his office he can’t miss. A large sign that reads "Bring Back Bobby" was hanging from the Louisville Student Activities Center on Sunday morning. The fan is of course referring to former Louisville head coach Bobby Petrino. Petrino led the Cardinals to a 49-9 overall record from 2003-06 before taking the Atlanta Falcons job in 2007. After a one-year stint in the NFL, Petrino bolted back to the college game at Arkansas where he brought the Razorbacks back into the national spotlight. But he was fired in 2012 after a motorcycle accident revealed a relationship with an athletic department employee in a bizarre scandal. 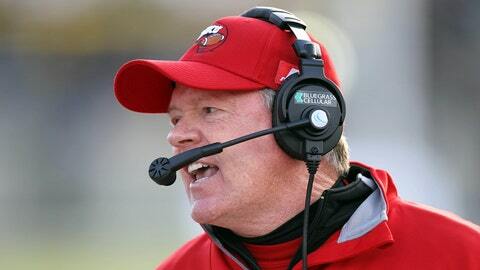 Now at Western Kentucky, Petrino led the Hilltoppers to an 8-4 finish in his first season. After he left Louisville, the Cardinals failed to finish above .500 in three seasons under Steve Kragthorpe before Strong’s arrival in 2010. Would Louisville give Petrino another chance?